Note: Louise is composing all the reviews this year while Cathy is on Sabbatical. She returns February 2018. A true story of how one man, Mike Osterholm, decided to uncover and restore a long ago buried creek. 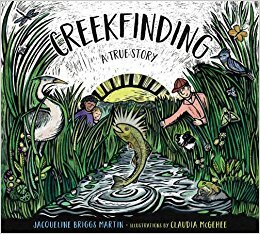 The lush, beautiful illustrations by Claudia McGehee really make this environmental story come alive. “But a creek isn’t just water. It is plants, rocks, bugs, fish and birds." Finally after several years, with patience, perseverance, and a lot of hard work, Mike had a healthy creek with plants and bugs and rocks and fish and birds. He called it Brook Creek and it is part of Prairie Song Farm in Iowa. Back matter includes an author and illustrator’s note, and more information about Mike Osterholm. A important addition to any library collection. Sounds interesting! Thanks for the recommendation! Yes, you are lucky, Maria. Thanks for noticing our book. Plants, bugs, rocks, fish, and birds are thriving at Brook Creek even as I write this. Good to know, Jackie. This is a beautiful and inspiring story. Thanks for writing it.